The first 9 holes are relatively easy, but the second 9 holes become tougher. The 13th to the 18th holes are particularly challenging and demanding. 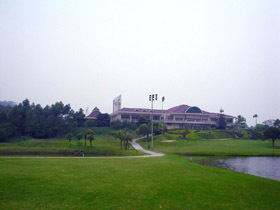 The overall layouts are not bad and the views are good as well; the course is surrounded by natural grandeur. It is also excellent to look at the clubhouse from the 9th and 18th fairways. A par 3 over water. The hole is difficult because water comes into play. A tough par 4, a dogleg to the right. The second shot is downhill. There are bunkers on the right side of the green and trees on the left, so an accurate approach shot is required. A slightly downhill par 3 with a good view. A very demanding, long par 5. The fairway is tight and undulated, which makes each shot difficult. There is OB on the left from the tee to the green. A relatively short par 5, on which a long hitter can hit the green in 2. However, the front side of the green borders the lake, so a long and accurate fairway wood shot is required. When you decide to lay up, the second shot is also difficult: the lake invades much of the left side of the fairway, making the landing area becomes tight. It takes 3 hours by bus from Hong Kong and 1 hour 30 minutes from Shenzhen. The gold tees are the longest but there were no tees on the day I played. Instead I asked the club to allow me to play from the longest tee-grounds without the tees. Neil Crater is Australian and his designed other courses are Hornbill G&JC and Astana G&CC in Malaysia.